Let’s face it. Ask anyone what their first job is and they’d probably say “babysitting”. And why not, right? It’s the nearest job one could get at an early age—but it doesn’t mean it’s the easiest. Simple as it may sound, babysitting may be the foundation of one’s good future, and parenting or guidance skills. Babysitting could be the core of people’s wellbeing, and the lessons we learned from it will stay with us until we grow old (and hopefully not lanky). Everyone has their own style of taking care of kids, but it’s still good to check on some guidelines on what and what’s not to do. 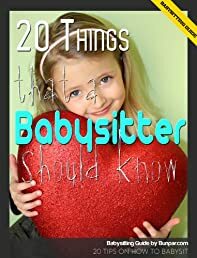 So without any further ado, here are the 20 things a babysitter should know on how to babysit. Download and Read now on your Kindle.